The fossils were found in the desert heart of Australia, and then hidden away, and almost forgotten in a museum collection for over three decades. A handful of tiny teeth have led scientists to identify the most distant ancestor of today’s kangaroos. The fossils were found in the desert heart of Australia, and then hidden away, and almost forgotten in a museum collection for over three decades. The findings are published in the Journal of Vertebrate Paleontology. Kangaroos are icons of Australia’s unique living fauna. However, their earliest ancestry is shrouded in mystery. 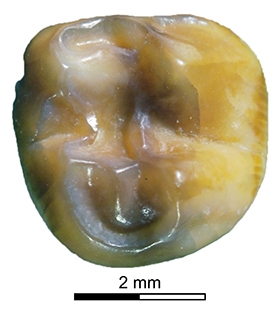 At the beginning of the 1980’s, a few enigmatic molar teeth were excavated by palaeontologists hunting for fossils around a dry salt lake in northern South Australia. The rare specimens were recognised as an ancient kangaroo ancestor, but had to wait for over 30 years before modern computer-based analyses could confirm the significance of the discovery. Originally dubbed Palaeopotorous priscus, Latin for ‘[very] ancient’, ‘ancient rat-kangaroo’, by the Australian palaeontologists Professor Tim Flannery (University of Melbourne) and Dr Tom Rich (Museums Victoria), the importance of these remains was suggested in their first unveiling to science. “The teeth of Palaeopotorous were initially described in 1986. Even then they were stated as representing possibly the most primitive relative of the entire modern kangaroo radiation. Yet, nobody ever evaluated this claim, and despite being occasionally mentioned in the scientific literature, they were never again examined in detail,” said Dr Wendy den Boer, who studied the fossils as part of her recently awarded PhD from Uppsala University in Sweden. “The name Palaeopotorous was established using a single molar tooth, although, eleven other anatomically very similar teeth were recovered during the expedition. None of these fossils were found in association, so it is still unclear whether we are dealing with one, or more species,” said Dr Benjamin Kear, Dr den Boer’s PhD supervisor and co-author on the published article. “This uncertainly means that we have had to use a complex series of analyses to assess its morphological similarity and evolutionary relationships relative to other members of the kangaroo family tree”. “Our results showed that Palaeopotorous was most similar to living rat-kangaroos, as well as some other extinct kangaroo relatives. Using information from fossils, and the DNA of living species, we were able to further determine that at around 24 million years old, Palaeopotorous is not just primitive, but likely represents the most distant forerunner of all known kangaroos, rat-kangaroos and their more ancient ancestors,” said Dr den Boer. “Palaeopotorous was about the size of a small rabbit, and probably did not hop, but would have bounded on all four legs. Nevertheless, a few bones found at the same site in central Australia indicate that the earliest kangaroos already possessed some key adaptations for hopping gaits,” said Dr Kear. 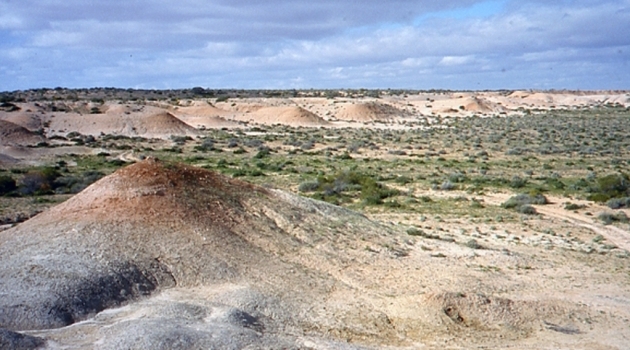 Palaeopotorous lived at a time when central Australia was much wetter than it is today. Its fossils were buried in clay deposits left by a river, but these earliest kangaroo ancestors would have foraged amongst vegetation growing nearby and along the banks. The teeth of Palaeopotorous were washed into the river after death, along with the remains of many other ancient marsupials. Full article: Den Boer, W. & Kear, B.P. (2018): Is the fossil rat-kangaroo Palaeopotorous priscus the most basally branching stem macropodiform? Journal of Vertebrate Paleontology DOI: 10.1080/02724634.2017.1428196.